This used to be my favourite outfit circa 2006 after my sister bought me this fab T from Top Shop in 3 colours for Christmas and I found this obi at Supre in 2 colours. 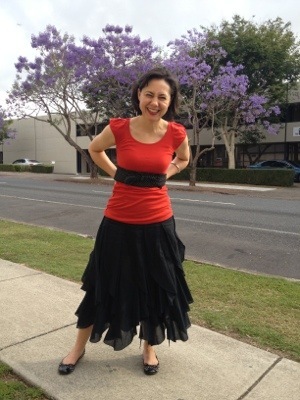 I had had this Sportsgirl skirt for ages – loved by students all over the world who called it the witch skirt! Apparently I used to wear this combo a lot on Tuesdays back in the days when I could wear the same thing more than once (pre-2012 wardrobe challenge) as a class I taught once a week mentioned to their main teacher that I always wore the same thing. Can you imagine my horror?! That really spurred me on to be more creative! I must say though that this year I have missed re-wearing great discovery combos but only about 70 days to go … And I wouldn’t have discovered the great discovery combos if I wasn’t being so creative with my wardrobe. Posted in fashion, Sportsgirl, Supre, work and tagged spring, Top Shop, Wardrobe challenge. Bookmark the permalink.